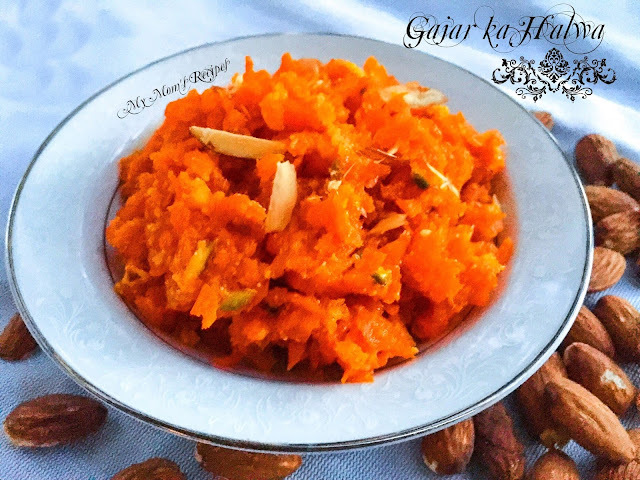 Rich...sweet...delicious....and very popular in winter months specially in Northern India..... Gajar Ka Halwa, a traditional Indian dessert with a creamy texture is one of my favorite dessert. 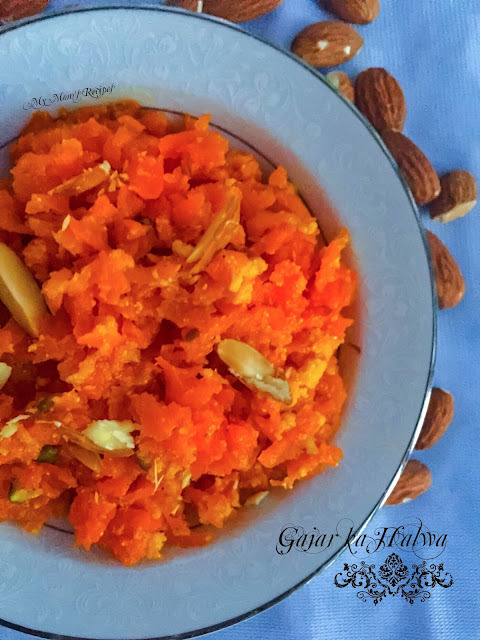 My Mom usually makes Gajar ka Halwa twice a month during winter season and all year long on special festive occasions. There are many different ways of making it. It can be prepared in a simple way by using whole milk or can be made in a rich manner by adding condensed milk (milkmaid) or mava(khoya). I decided to opt my Mom's recipe of preparing it with homemade Khoya/Mava and generous amount of dried nuts and Ghee. Bring 1/2 L / 2 cups Milk or 1/2 quantity Half & Half to boil in a heavy bottom saucepan. Reduce the heat and continue cooking at simmering point. Keep stirring so that milk does not stick to the base of the pan. As milk gets thicker stir more vigorously. The khoya is cooked when the milk is reduced to a thick, dry lump and it has stopped sizzling. Remove from the pan and leave it to cool. Use within fortnight. Boil the remaining Milk in a pressure cooker. Add grated carrots. Close and bring to one full pressure on high heat. Remove the cooker immediately from heat. Release pressure with slight lifting of vent weight. Open cooker and transfer the whole thing into wide thick bottomed skillet. 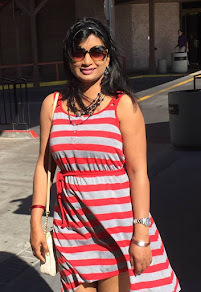 Add Mava (Khoya). Cook on medium heat (approximately 15 minutes), stirring occasionally. Add Sugar. Continue to cook and stir the Carrot mixture till it dries. Add Ghee. Cook till ghee shows separately (approximately 10 minutes), stirring constantly. Remove from heat when still moist. Stir in the Saffron, Cardamom powder and Almonds. If not serving immediately, refrigerate Halwa and re-heat and serve when desired. your halwa looks so perfect. Even you have prepared khoya of very light colour...whenever I am preparing it comes out to be in a very dark brown colour. @ Annie...Khoya should always be prepared on medium-low heat. I love cooking..but now i want to cook new and different receipies. This one surely i will try. My measurement i.e 1 kg Carrots is a good enough amount as a dessert after dinner for 12-15 people. 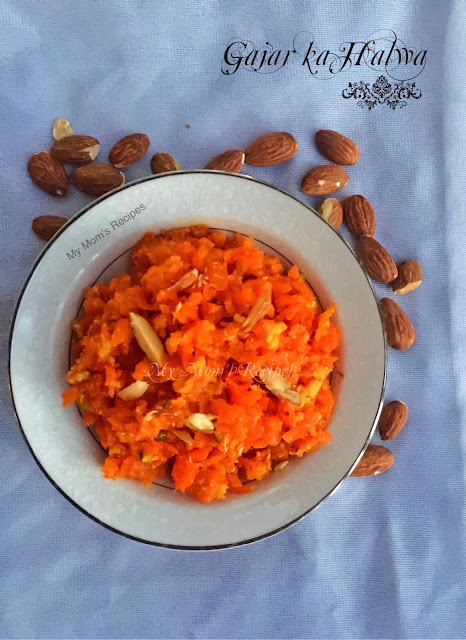 For 25 people, 1.5kg Carrots will be OK and accordingly will be the ratio of Milk and Khoya. Wow amazing.. I m goin to try this tonight! Hey ...could you please let me know if it's ok to use evaporated milk instead of khova? if yes, would you be able to tell me the substitution? Yes, a can of evaporated milk or condensed milk can be used instead of khoya. You can also opt a popular Indian sweet named "Kalakand" in absence of above ingredients. Kalakand should be addend in the just before removing the end product from heat.